Uh...you're just trying to mess with us, right? Just to see how far down the rabbit-hole we'll follow. Beautiful stuff Kevin!! Can't wait to see more of it! Seriously?! Is this coming out? 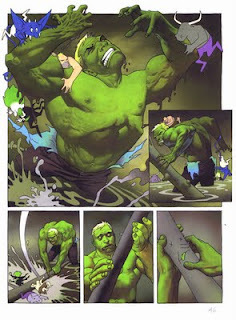 I'd love to see a Nowlan Hulk story! Who wrote it? I'll tell you more about this one later. But it isn't a Hulk story. Awesome, Kevin!!! Reminds me of the pages you did for Man Thing GN. We will see this year? Kevin, this is the greatest effing thing I've seen by you in a while. It looks so much like something you would have done a decade ago but in a good way. Gorgeous. nice work. And I liked seeing the process, too.